A grandmother who has run more than 20,000 miles across 12 countries in five years is back in the UK. Rosie Swale Pope, 61, says she is "full of beans" after arriving in Scrabster on the northern tip of Scotland to finish her round-the-world trip. She has overcome frostbite and broken ribs during her journey, which was to raise awareness of prostate cancer following the death of her husband. After landing, she plans to run to her home in Tenby, in Pembrokeshire. A crowd which included her son, James, friends from Wales, and a bagpiper greeted her as she arrived at 0430 BST after taking the ferry from the Faroe Islands. 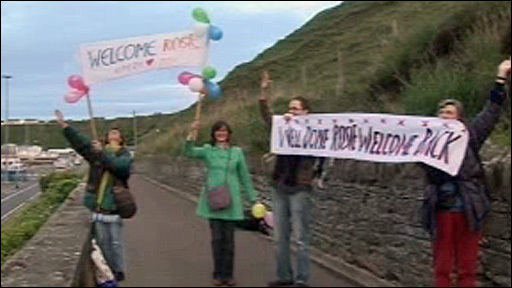 Friends and family greet the former round-the-world sailor as she arrives back in the UK. It marks the final leg of her adventure which she began in south west Wales on her 57th birthday in 2003, in the belief it would take about two years. 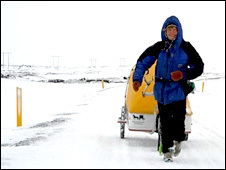 With no back-up team and little funding, she ran through some of the planet's most remote and rugged areas, pulling a cart containing provisions. On most nights, she camped at the side of the road. Her route has taken her across Europe, Russia, Asia and north America. When she reached Times Square in New York in October last year, she draped herself in a Welsh flag. During her journey she has been hit by a bus, suffered pneumonia, frostbite in Alaska and had a breast cancer scare. She was confronted by a man with an axe in Siberia, was knocked unconscious as she tried to cross a river and has gone through 45 pairs of shoes. She has overcome her latest setback, breaking several ribs during a fall in Iceland, to begin the last UK leg of her trip. But she said the trip had been worth it. "What else would I be doing? "Sat around thinking about what I did in the past?" she said. "The best thing is that if my run around the world, which is just a small thing really compared to what many people do, if it saves a life or two by raising cancer awareness and makes a little bit of money for charity, that's just brilliant." Her plan now is to run the west coast of Scotland, through Cumbria and Lancashire, on to Liverpool, and then through Wales. "It's fantastic to have set foot in Great Britain again," she said. The adventurer first became well known when she crossed the Atlantic alone in a 17ft boat. She also sailed around the world with her first husband Colin some 35 years ago and has completed a 3,000-mile horse trek through Chile and a run across the Sahara desert. She started running when she was 48 by taking part in a local race in Tenby, and was one of the last to finish. She is expected to end her round-the-world journey in August. As well as aiming to increase awareness of prostate cancer after the death of her husband Clive Pope, she is raising money for a children's home in Russia run by the Kitezh educational organisation.